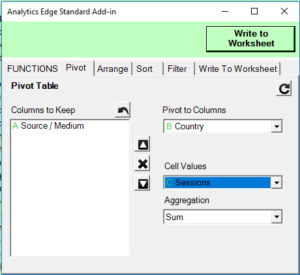 The Analytics Edge Standard Add-in works with any Analytics Edge Connector to download your data and pivot, arrange, sort or filter using a simple wizard interface – no programming and no formulas required! Working similar to the Analytics Edge Basic Add-in, you can place query results anywhere on a worksheet, and you can have as many queries as you want. They all refresh with a single click! Online help and confidential email support is provided, with quick access to a growing list of free Excel reports. The add-in even alerts you to upgrades and free trials available, all easily installed with a simple click. The Free Google Analytics connector has almost all of the Core Reporting features and capabilities as the paid version. No login limit, no profile limit, no query limit. All the latest dimensions and metrics, dynamic date ranges, custom segments and filters, download more than 10,000 rows, and minimize data sampling errors. Dates are downloaded as Excel dates, percentages ready to be formatted as % in Excel, and numeric dimensions can be downloaded as either text or numbers. Analytics Edge takes the pain out of working with the Google Analytics API. The free Social Share Counts connector can grab social network sharing counts for any URL, yours, your competitors, or your customers. Process a full list right in the spreadsheet. Get LinkedIn, Pinterest, Reddit, StumbleUpon and Google +1 counts on a single refresh. With the Analytics Edge Standard Add-in, your data download and analysis efforts are dramatically faster, and ongoing refreshes are effortless.